Thinking about heading to the beach or lake now that the weather is nice? Maybe your plans include spending time in your garden or relaxing by the pool. Regardless of how you plan to spend your time in the sun, you must remember to protect your skin. There is a lot to know about how to protect your skin from getting skin damage, or worse, skin cancer. One out of every five Americans will be diagnosed with skin cancer in their lifetime. That comes to approximately 3.3 million Americans each year. You’re lucky we’ve got you covered. Check out our top seven reasons why you should consider protecting your skin this summer. Be sure to follow these tips so that you can take preventative measures to protect your skin. Wear a hat when you’re outside during peak hours. A hat can protect your hair, eyes, and neck from harmful UV rays. Sunrays are the strongest from 10 a.m. – 4 p.m. Cover up with clothing. While it might seem uncomfortable and not fitting for the season, it is important to still cover up when spending long periods of time outside. Chambray, rayon, linen, and cotton are the most comfortable clothing to wear during the summer months. Wear 99%-100% absorption sunglasses. The sun’s rays can damage your eyes and surrounding skin if not protected. This could lead to loss of vision or unsightly wrinkles around the eyes. Seek shade. Finding comfort in the shade will keep your body’s core temperature down while protecting you from UV rays. You will feel more comfortable and can tolerate the outdoors better. Use a sunscreen of SPF 30+ or higher. This is the standard for sunscreen protection and gives you up to 97% protection. Avoid tanning beds. While they might seem like a healthy alternative to the sun, tanning beds give off UV radiation and can increase the risk of skin cancer by 75%. Protect skin on cloudy days. Even on cloudy or overcast days, 80% of the sun’s rays still penetrate through the clouds and can cause sunburn. The epidemic of damaged skin and skin cancer derives from exposure to UV radiation. Therefore, avoid intense sun exposure even on cloudy days. It is also important to be aware of any suspicious lesions or abnormal-looking moles on your skin. If any are found, be sure to immediately report to your dermatologist or a skin care professional. 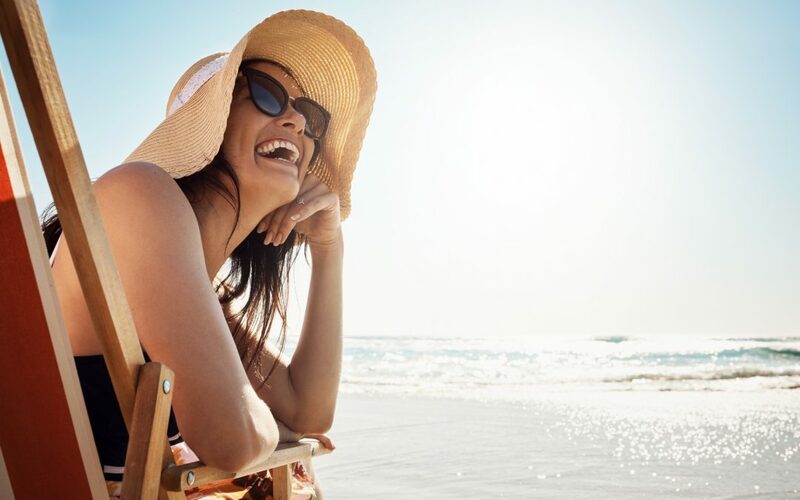 To help get the best products for your protection, we are offering 20% off all sunscreen products in honor of skin cancer awareness month all month long. Be sure to stop in today for healthy skin tomorrow!